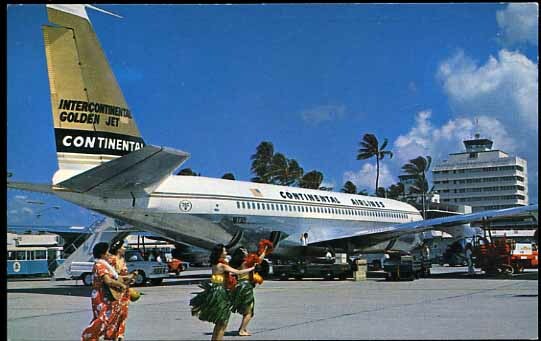 On September 2, 1964, Continental Airlines brought its first flight into Honolulu after flying from California to Japan, Philippines, and Guam, completing the initial survey flight of the MATS contract Pacific service. Honolulu was established as Continental’s largest overseas base. Please read the following Terms & Conditions of Use carefully before using this website. You are required to expressly accept the following Terms and Conditions of Use, without any modifications, prior to each use of this website. The State of Hawaii Department of Transportation Airport Division (the “HDOTA”) may revise the Terms and Conditions of Use without any specific notice to you. The Terms and Conditions of Use posted at the time of your use of this website governs that use. If you do not agree with any part of the following Terms and Conditions of Use, you will not be permitted to use this website. The images and other content, (the “Media”), on this site, http://aviation.hawaii.gov, are protected under applicable intellectual property laws. Unless otherwise stated, intellectual property rights in the website are administered by HDOTA on behalf of itself and the State of Hawaii. You are prohibited from using the Media for any commercial purpose. Any use, whether or not commercial, that may tend to degrade, tarnish the reputation of, or embarrass the content creator (photographer, videographer etc. ), the State of Hawaii, or HDOTA is strictly prohibited. The following are general examples of what Media may not be used for or in connection with. The following list is not exhaustive. Taking or attempting to take any action that involves reprinting on coffee table books, garments, posters, mugs, or any medium. You agree that, upon notice from HDOTA, you will immediately cease all use of the Media and, to the extent possible, remove all Media from any and all materials in which they appear. Credit is required for each of the Media as specified on this website. Credit must be placed adjacent to any use of the Media. You, your successors and assigns, agree to release, indemnify and defend HDOTA and the State of Hawaii from and against all costs, liability, loss, damage, and expense, including all attorneys’ fees, and all claims, suits, and demands therefor, arising out of or resulting from your acts or omissions under these Terms & Conditions of Use and your use of the Media.